Red Bull Music Academy has never failed to set tongues wagging for their special musical showcases. The institution has once again justified its position as one of the best event curators in the scene with the recent announcement of an upcoming special live music showcase featuring Detroit legends, Octave One on March 17th. That’s right folks! America’s favourite techno siblings are set to tear the roofs off kyo Kuala Lumpur with a long-awaited debut performance at one of the city’s hottest clubbing destinations. The Octave One brothers Lenny and Lawrence Burden have a healthy 12 albums and over 100 records credited to their names since they launched their debut track almost thirty years ago. Their first single “I Believe” was released on the on the massive Techno 2: The Next Generation compilation alongside Carl Craig, Marc Kinchen and Jay Denham in 1990. Their track “Blackwater” has also achieved classic status along with other goodies like “The X-Files”, “Empower” and “Siege”. As performers, Octave One has been often praised as being among the very best live acts around. It’s not hard to see why after a peek at the duo's live set-up, which is always decked with a bounty of hardware that somehow keeps them and their music constantly in motion. The duo will also be popping by kyo Singapore the following day to celebrate the club’s fourth anniversary. 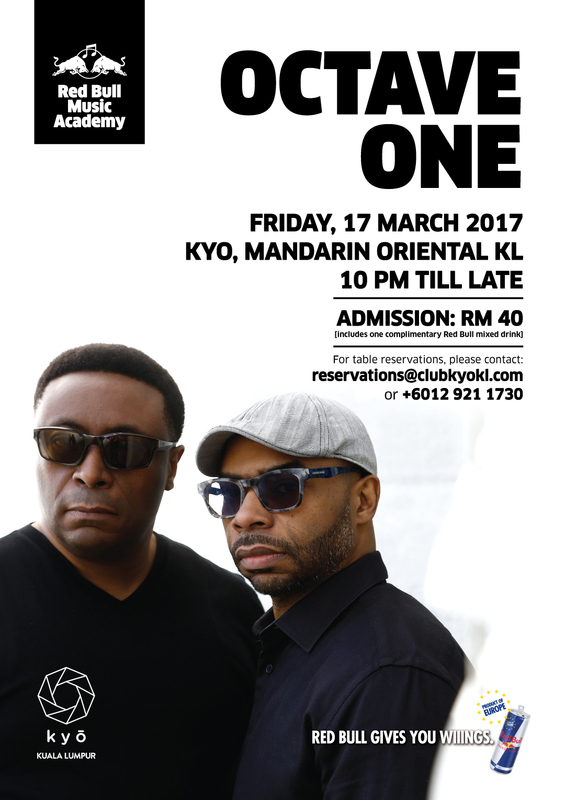 Check out all the info on Octave One’s tour here. Meanwhile, take a peek and have a listen to their live set at last year’s Awakenings shindig at the Amsterdam Dance Event in 2016 below.